← Preview of P&G Championships – Seniors. What They Have to Prove. The first night of competition for the P&G National Championships was quite a roller coaster, reminiscent of the 2011 National Championships. Three of the top five girls had falls, including a number of falls from girls that were so unexpected, everyone’s jaw dropped. 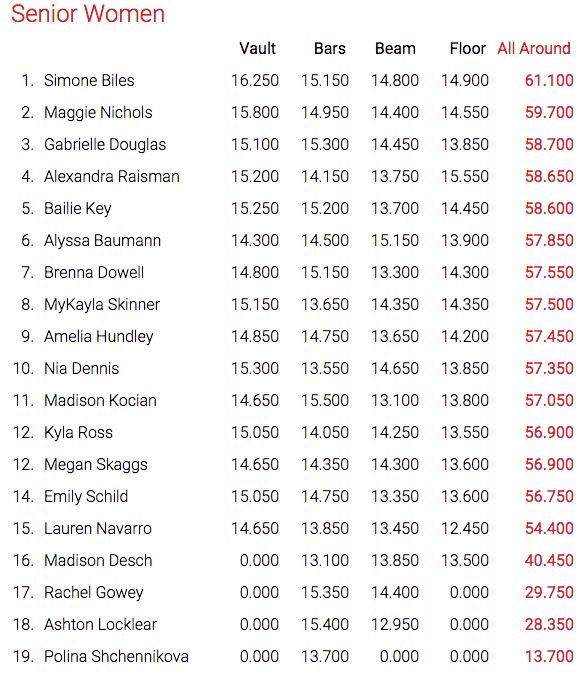 Probably the only two things that went as expected were Simone Biles leading at the end of the night and Maggie Nichols having a fantastic night of competition. Most everything else was fair game to give gymnastics fans quite an emotional ride. And that was after the fan favorite fluff showing the National Champions over the years. Biles walked away from the night leading the standings, but had a rough night of competition. That being said, most gymnasts would give everything to have a 61.1 on their best night. She began the night with one of her best bar routines, scoring a 15.15. She had a rough day on beam in podium training, but she was able to stay on in competition. However, she had a few significant wobbles, leaving her with a 14.8. Biles moved on to floor, where she showed her characteristic power and charm throughout, until the very end where she landed her easiest tumbling pass on her hands and knees. Even with a fall, she has the second highest floor score, a 14.9. The true test of a champion is seeing how they come back after a mistake. Biles has rarely been tested this way, and she passed with flying colors. She ended her night on vault, where she stuck her sky high amanar, a feat she is usually only able to do in warm up, scoring a whopping 16.5. Though Biles led the standings at the end, this night belonged to Maggie Nichols. Shining on every event, she posted a 59.7 and led the first three rotations. 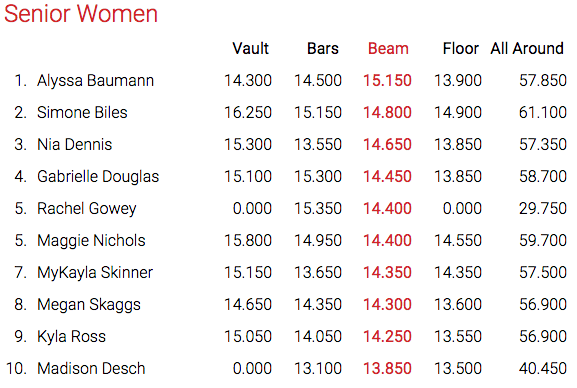 Starting on vault, Nichols threw her newly debuted amanar, and looked like a veteran. Scoring a 15.8, the same as she did at Classics, she is quickly making her way to be a staple in a world vault line-up. Showing the same consistency on bars, she scored a 14.95, again the same score as at Classics. Nichols moved to beam, where she successfully debuted her new incredibly difficult full twisting double back dismount for a 14.4. She ended her night on floor, where she looked like she was having the time of her life and enchanting the crowd, earning a 14.55. Gabby Douglas just held on to the third spot, but had a very consistent night to earn a 58.7. Douglas has not returned to her previous level of difficulty, but she is showing a mental toughness and consistency that she didn’t have in 2012. She also started on vault, where she showed a clean DTY that showed lots of room for an easy amanar and scored a 15.1. She moved on to show an easy swinging, high flying bar routine for a 15.3. Douglas went on to beam, and showed another consistent routine for a 14.45. 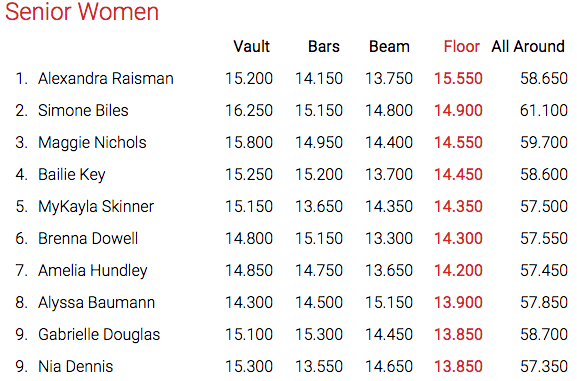 Douglas finished on floor, where she had a lot of wobbles out of her turns and jumps, but managed to hold on to third with a 13.85. Aly Raisman and Bailie Key each followed by just a half a tenth to finish fourth (58.65) and fifth (58.6) respectively after both having issues on beam. Raisman fell on a jump connection after landing a little off on her layout and Key put her hand down on the beam on the same skill. However, they both had great nights on every other event. 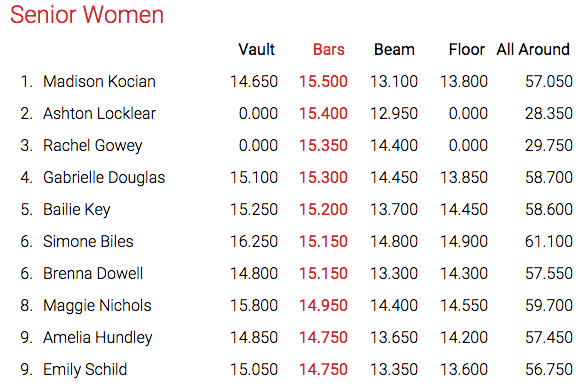 Kyla Ross had her own “worst nights” with a fall on her bars dismount (but she made her Bhardwaj) and putting her hand down on floor to finish 12th. Other notable mentions were the top three girls on bars, who all may have potential to contribute to a world team. They each delivered hit bar routines that go a long way to making their case. Gowey also added a great beam routine, showing she can be used on both events if needed. Alyssa Baumann scored the highest beam score, delivering a 15.1 and was the only one to break a 15. MyKayla Skinner showed great improvement from Secret Classics, and put in a solid performance on each event. Brenna Dowell also had a great night, making her way back to her former elite level. Nia Dennis also put in one of her best performances, landing in the top three scores on vault and beam.